Finally, after four straight videos focusing on the male characters, we have one of our female characters show up under the spotlight! Not only is she a weapons expert and loves to make things explode, she’s a tagger, often leaving symbols on the walls and floors and pretty much anywhere to express her opposition to the Empire. Sabine, as everyone already expected, is a Mandalorian with a background we don’t know much about so far. Voiced by the lovely Tiya Sircar, Sabine is a wonderful and refreshing addition to the Star Wars universe. Also, did you see the wolf-like creature on her shoulder plate? Dave Filoni is sneaking his love for wolves! 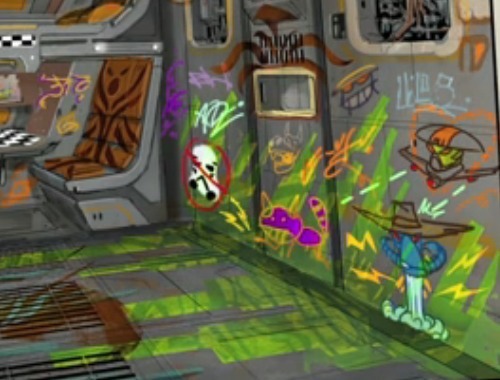 Lastly, did you catch Cad Bane and Embo spray painted on the walls? How cool is that?! Did she know them? We’ll have to wait and find out! Read more about her and check out her character video over at the Hollywood Reporter.